Manchester United are interested in a host of players to make their squad better as they fight for the last champions league spot with Chelsea and Arsenal. 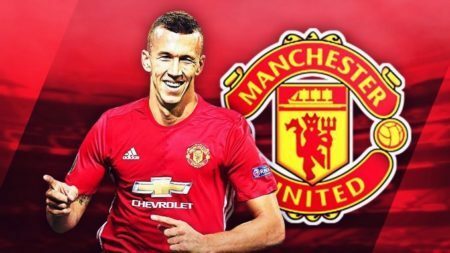 The latest name to be thrown around in the transfer tavern is Ivan Perisic of Inter Milan to join Manchester United. The Croatian hugely impressed former United coach Jose Mourinho but a transfer never materialised. However, it looks as if the club have returned for the 29-year-old and a €40million price tag has been quoted. Other suitors like Atletico Madrid have also been mentioned to be interested in the winger. Here’s how Perisic will look in Man Utd Jersey when he finally joins. Perisic has been the player we saw at and before the World Cup. His stats this season are played 18, scored three and assisted two. These are not very convincing stats for a winger commanding huge transfer fees. The former Wolfsburg man was close to joining United during Mourinho’s rein but a bid of £40 million was rejected by Inter and the player decided not to force a move. It was also claimed that the United board declined to sanction added fund to see the deal through and so out of favour Martial continued to feature as a winger. United haven’t made any transfer dealings this January and even if they chose to it will be for a defender not a winger.